PMBComments: On the State of Venezuela's Democracy: Feb 15/12 | Stunning Primaries, Stunned Regime: What is next for Venezuela? Feb 15/12 | Stunning Primaries, Stunned Regime: What is next for Venezuela? Whatever the outcome, this young man might have his hands really full! PMBComment | The following 6 numbers are a good starting point for a commentary on Sunday’s opposition primaries in Venezuela. This outcome – viewed in its full dimension – was nothing short of stunning. For the opposition it represents the very – and I mean very – best case scenario in terms of turnout, mandate for the winner and reaction from the losers. For the regime it is – obviously - the worse (as in, very worse) scenario; made all the worse by the derision with which they had treated and had tried to derail the entire primary process. As a result of this sharply asymmetric outcome, we have entered into a near-term-high-conflict zone. Given the consequences for the Bolivarian revolution of an electoral upset in October, they will, in all likelihood, try every trick in the book, use every penny in the treasury (plus foreign ‘loans’) and forge any nasty alliance necessary to hold on to power. Given the high cost of ejection and the complexities associated with stealing an election post-facto, anything they do now (as in, sooner rather than later) will seem rational and cheap by comparison to the panicky incumbents and its wide spectrum of nefarious foreign allies. Yesterday’s unsightly maneuvering by the regime-packed Supreme Court, trying to change the agreed norms for the treatment of critical data from the primaries, is but an early indication that this will be a no- holds-barred contest. Mr. Capriles’ overwhelming mandate gives him an ‘aura of victory’ that should translate into a commanding lead when the first post-primary polls are published in a couple of weeks. This will exacerbate the paranoia of a not-yet-cured Hugo Chavez who just a week ago tried to force feed the country a callous “we are the second liberators of this country” narrative meant to rewrite history and enshrine – as charity - his reckless and deadly 1992 coups. The Meta message of that histrionic and narcissistic “4F” celebration was: “WE are your saviors and WE are here to stay”. That “WE” referring not to his party, but to the military that he then tried to enroll by fiat, en masse, Sukhois and all, into militant “chavismo”. As it turn out, that same military, commanded by thugs, was on the street Sunday protecting opposition polling stations with hardly an incident to report, and – worse yet - with actual smiles detected on the faces of many a soldier and mid-level officer. It is this reversal of fortune that must have Hugo Chavez in one of his two extreme psychological states: paralyzed by fear or violently despondent. Those around him – opportunists and sycophants – must once again revisit contingency plans which the most gullible had probably stored away soon after Chavez pulled the “I am cured” and ‘I can speak to the National Assembly for nine hours without peeing’ gambit. The actions of Chavez’s inner circle – civilian and military, local and foreign – will determine the nature of the confrontation ahead. It is hard, if not impossible to envision a scenario were Sunday’s stunning results are a guarantee of an electoral finish to the criminalized Bolivarian revolution. With the primaries out of the way, massive boulders lie scattered on the road to an opposition victory and democratic and sustainable governability. Mr. Capriles won the hearts and minds of a sizable group of Venezuelans and he did so with a strategy that many of us have considered a bit risky. Trying to sell a rosy future to an exhausted country seems prima facie a valid, and as just proven, a winning, strategy. The problem lies in the nature of the expectations this “don’t worry, be happy, hug your tormentors” approach ends up creating among the most needy and even the not-so-needy. If incompetent State paternalism was the bane of the ancien régime that Chavez obliterated, it is the sole defining factor of XXI century Socialism a’la Chavez. Capriles is promising to continue something that has been - but cannot continue to be – ‘financed’ with free gasoline, ever increasing foreign borrowing, deficit spending, printing Bolivares, laundering money, foregoing requisite investments or ignoring the dictates of democratic public accountability. The country’s coffers are empty, but social needs and expectations have never been higher. PDVSA, the oil monopoly, is in physical, operational and financial shambles, but so are most of the state enterprises, hospitals and schools in the country. Venezuela is heaven (and haven) for global criminals and hell on earth for honest local judges and policemen. How do you deal with the first in the absence of the latter? Drug cartels today act with total impunity but tomorrow might do what they always do when threatened by law enforcement and public opinion. The military is divided, demoralized and full of indecent characters, but it would be nice to count on them and their loyalty - as an institution - if the losers become sore and vengeful. Foreign aid in all shapes and forms will be needed, but foreign ambitions and meddling will have to be rolled back and checked. Bureaucracies will have to deliver and financial institutions will have to lend, but thieves within them must be outed. Objectively speaking, a very long list of bad news that might well ruin any eventual victory lap and which is both dangerous (and apparently futile) to discuss in public and too dangerous to hide under the proverbial rug. Mr. Capriles is young and above all things extremely resilient. His walk is much better than his talk which can actually be a good thing. He has been in the crosshairs of Chavez’s Cuban puppeteers since very early in the game. When combined with the likes of Leopoldo Lopez and Carlos Ocariz, and why not, Maria Corina Machado, they prove an ill fit for the inane, but highly effective cubanite slogan: No volveran! (They will not return). The fact is that the face of Venezuela’s opposition is at long last fresh and does not conform to the caricature Mr. Chavez has effectively painted of the past. They simple were not around in the past. Period. Every one of them entered politics upon or after Chavez’s rise. Sunday’s results were a massive blow to AD and Copei, the traditional parties that once monopolized power but that have come to resemble whorehouses without señoritas, trains without engines, memories without future. Chavez will miss them. He has till now counted on them to, among other things, envelop emerging leaders and sap them of their enthusiasm and charisma. I, like millions of others, would rather take a gamble on youthful inexperience than continue to be hostage to a game of extreme unity that had until now spared many crooked so-called ‘leaders’ from their well earned banishment. Mr. Capriles, with the timely help of Leopoldo Lopez, has definitively earned the right to build a new majority that could very well banish the labels “chavista” and “anti-chavista” and focus on Venezuelans who are ready to work hard for a prosperous, fair and safe Venezuela; one in which the State does only what others can’t and where a level playing field and competition fuels the economy and brings to the surface the best the country and its diverse citizenry have to offer. To move forward we have to watch the boulders on the road, understand that the enemy is despicable and full of fear, and prepare not just to win but also to govern. Capriles and his team must be ready to explain and competent in their exposition of our many woes and seek assistance wherever in the world we might find a helping hand. The problems of Venezuela are daunting, but its potential remains dazzling. Mr. Capriles and his youthful team deserve praise and assistance. A change of Presidents will not solve our nation’s problems, but without the change they will simply multiply. The hardest part lies ahead, but Venezuela now enters a new phase - full of dead serious and deadly challenges - with renewed faith and with a surprisingly strong mandate from – and to - people that seem determined to outwit the whim of spent autocrats from both ends of our polarized society. 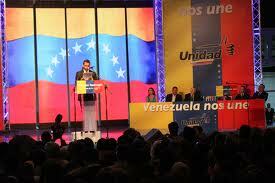 Finally, hats off to the operational teams of the Mesa de la Unidad, and to the candidates themselves. We would not have this last chance to disrobe and disarm a despot without them.